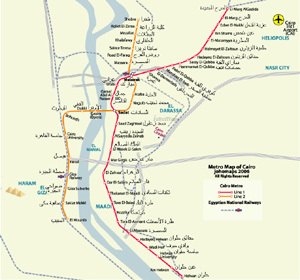 While al-Qāhirah is the official name of the city, in local speech it is typically called simply by the name of the country, Miṣr (Arabic, مصر) pronounced Maṣr in the local dialect. The oldest part of the city is somewhat east of the river. There, the city gradually spreads west, engulfing the agricultural lands next to the Nile. These western areas, built on the model of Paris by Ismail the Magnificent in the mid-19th century, are marked by wide boulevards, public gardens, and open spaces. The older eastern section of the city is very different: having grown up haphazardly over the centuries it is filled with small lanes and crowded tenements. While western Cairo is dominated by the government buildings and modern architecture, the eastern half is filled with hundreds of ancient mosques that act as landmarks. West of Giza, in the desert, is part of the ancient necropolis of Memphis on the Giza plateau, with its three large pyramids, including the Great Pyramid of Giza Approximately 11 miles (18 km) to the south of modern Cairo is the site of the ancient Egyptian city of Memphis and adjoining necropolis of Saqqara. 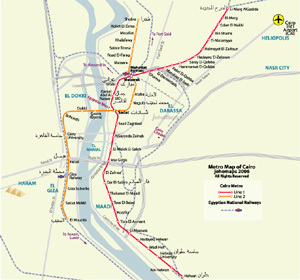 These cities were Cairo's ancient predecessors, when Cairo was still in this approximate geographical location.